A front-page, above-the-fold story in the Daily Record today discusses how antis are concerned with "loopholes" in the hours-old Red Flag Law. The below link is behind a paywall, but, honestly, the text that you can see says it all. For those unawares, the Daily Record is widely read in the Maryland legal profession. You can bet many of our comrades in the Politburo will see this. I am thinking they will go for California-style expansion next session. Wonder how they would feel if they were the targets of the law they passed! Maybe we need an addition, a red flag law for attorneys who are going through personal crisis. After all they make important decisions that can have life-changing ramifications for their clients. And don't worry about the no due process, after all this is an important thing, it's for the children. I'll bet if that idea were tacked onto a bill they wouldn't get anything more than side glance from a committee before they tabled it. These only affect gun owners. Impossible. We need a red flag law for middle-aged loons. They, for the most part, seem to share the same mental disease. ANYONE can be 1302'ed - not just firearm owners. The police and courts do not know if the person owns firearms, and thus will issue a 1302 regardless. As said upthread, will LEO really investigate the initial claim? Who are those Mom's in the picture. They should be the first served with 1302's, followed by Hogan's staff. 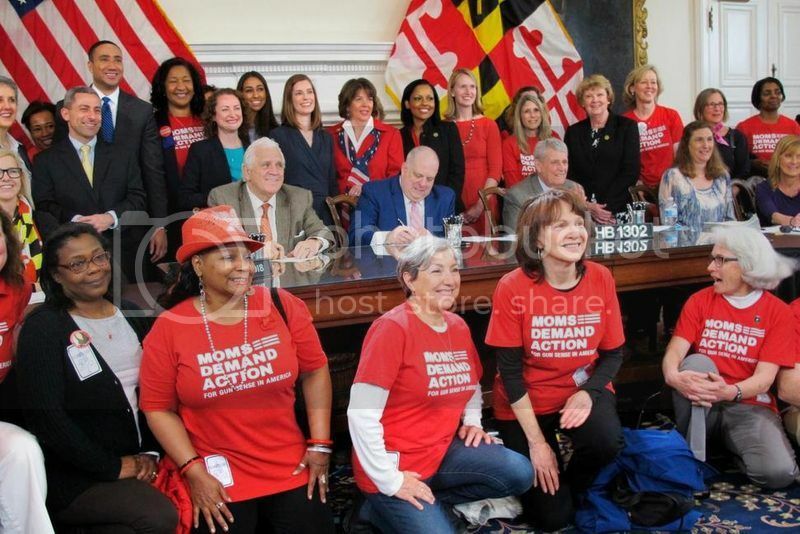 This is EXACTLY why we need to re elect Hogan so he can kill this horrible.....sign into law this much needed COMMON SENSE legislation so he can take credit for it and put another feather in his cap for future political aspirations. He already said in the “debate” that MD has the toughest gun laws in the nation but we need to do more.